During biped locomotion the foot ground interaction plays an important role, as it takes the reaction force acting on the foot and allows stable walking of the biped robot. Generally, the foot is considered to be hard to solve the gait generation problem and dynamic balance aspects of the two-legged robot. However, a layer of rubber is placed on the sole of the robot to act as a shock absorber for all practical purposes. It is important to note that the soft sole gets deformed during walking of the robot and allows the limbs of the robot to bend that influences the dynamic balance of the walking machine. The aim of this study is to use two different non-traditional optimization algorithms, such as particle swarm optimization (PSO) and artificial bee colony (ABC) algorithms to obtain the optimal hip trajectory, damping coefficient and position of the lumped masses for a 7-DOF biped robot ascending the staircase. The dynamic balance of the gaits generated with soft sole is verified using the concept of zero moment point (ZMP). Further, the energy consumed in ascending the staircase with and without soft sole has been computed. The results of this study proved that, least energy is consumed with soft sole having correction for the deformation. Biped robots are designed and developed to work in various man-made environments, such as staircases, sloping surface, obstacles and ditches etc. Many investigations were carried out on the gait generation and its optimization with respect to the energy consumption in the system. Asano et al. (2005) studied the passive dynamic walking performed by the compass-gait biped robot. They investigated the effectiveness of this algorithm through numerical simulations. A unified feedback control law for n-DOF biped robot with one degree of under actuation was proposed by Hu et al. (2011) on a sloping surface. The proposed method was tested with the help of two kinds of biped robots. 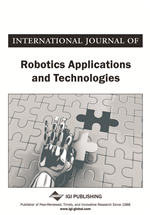 Moreover, in (Wei In & Vadakkepat, 2004), the authors developed a hybrid controller for generating gaits of Robosapien robot. The controller developed uses a combination of dynamics –based approach with central pattern generator. It is important to note that the concept of zero moment point (ZMP) was proposed by Vukobratovic et al. (1970), and it had been used to verify the dynamic balance of the legged robots. Moreover, several mathematical models for walking on the flat surface (Pleaten et al., 2003; Yang et al., 2010), ascending staircase (Capi et al., 2001; Lim et al., 2014) and obstacle crossing (Lathan et al., 2012) were developed by various researches after assuming the hard foot ground interaction. Recently, Wang (2013) developed a biped robot balance control method based on force resistance preceptor mechanism and ZMP. The developed algorithm was tested on a real robot and obtained rapid and smooth motion. Later on, Lee and Ryoo (2014) tuned the walking gaits of the humanoid robot using the concept of ZMP. The developed algorithm was able to tune the intuitive parameters of the robot that help in improving the performance of the biped robot. Most of the works discussed above related to the gait generation of biped robots on various terrains are purely mathematical in nature and does not involve any optimization methodology. Therefore, the gait generated utilizing those methods may not be optimal in any sense. Later on, few researchers used non-traditional optimization methods for modeling and optimization of gait generation problems of biped robots on different terrains.